It was packed. The rows were filled with teenagers and young adults, overwhelmed with excitement, their voices bouncing from the walls. My sister and friends who organized the event ran from corner to corner, making sure the event was running as planned. We were all here for the same reason. I felt a soaring wave of excitement as the crowd hushed and the host gave his introductory speech. It was happening! I think everyone was disappointed, but no one was shocked. Somalia has been in a state of despair for more than two decades. What I think let down everyone is that things appeared to be getting better. Eight months earlier, we had gotten a new president, Mohamed Abdullahi “Farmajo” Mohamed, who promised that religious extremist groups such as Al-Shabaab would be gone. Things were going to change, until they didn’t. We took one step toward progress and we went two steps back. It was devastating. Would we continue on this fluctuating path of success and disaster? What could we do, other than donate money to the afflicted? Miski Abdi, my sister, knew there had to be a way to act, to respond. A naturally charismatic person, occasionally to the point of embarrassment for her younger siblings, her casual social media conversations turned into a meeting within days. Six people showed up to brainstorm a solution. “What can we do that would help immediately?” was the first question on Abdi’s mind. Naima Jamabrought donation boxes, which the group distributed to local restaurants such as The Nicollet Diner. Within a few days, cash started to accumulate, and they had to assign people to pick it up weekly. They wanted to do more. The bombing wasn’t the first tragedy to hit Somalia last year. A drought also struck the country, triggering a famine that impacted millions. Afro Deli and dozens of other restaurants and coffee shops raised money through an event called “Dine Out for Somalia” in the spring. Abdi’s group hoped it could emulate their success with a similar event but found out that other restaurants were already working with the Masjids. They instead decided to host a fundraiser.But in a community that had grown desensitized to tragedy throughout years of hardship, a typical fundraiser wasn’t the right approach. Instead, Abdi and her friends hoped to create something different that would connect and empower the audience. The focus was a celebration of culture and looking forward to the future. This night would also engage Somali youth. Everyone in the group had something to contribute. One girl had a knack for design and made promotional materials ranging from T-shirts to posters. Someone else had ties to Safari Restaurant and suggested it could host the event. Once the venue was confirmed, the ball started to move – which was good, as organizers had only three weeks to pull off an event on a limited budget. Social media was vital to pulling the event together. With tech-savvy young people, word could spread quickly. A video featuring black and white photographs of the organizers, details of the bombing’s impact and uplifting orchestral music laid out the goal for the evening. 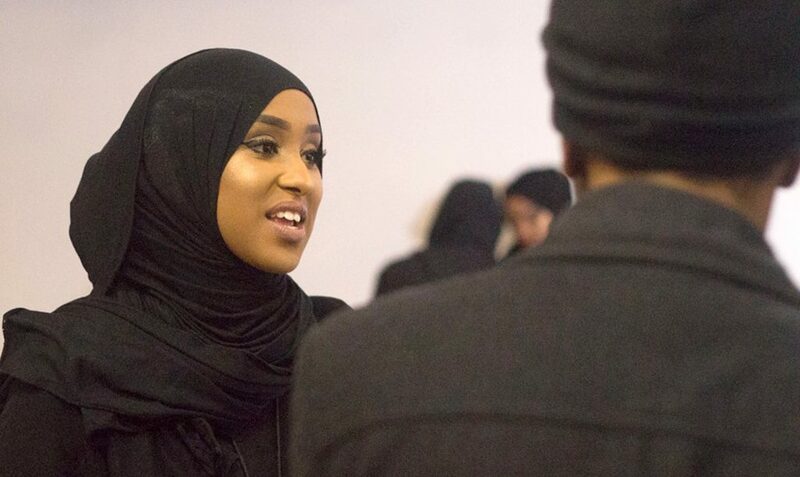 Abdi knew that excitement had begun to build in the community, but the response at the event was even greater than she expected. Organizers had to pull in extra chairs and nearly ran out of space as more and more young people arrived. Several local designers showcased athletic, normal and casual wear in a fashion show. 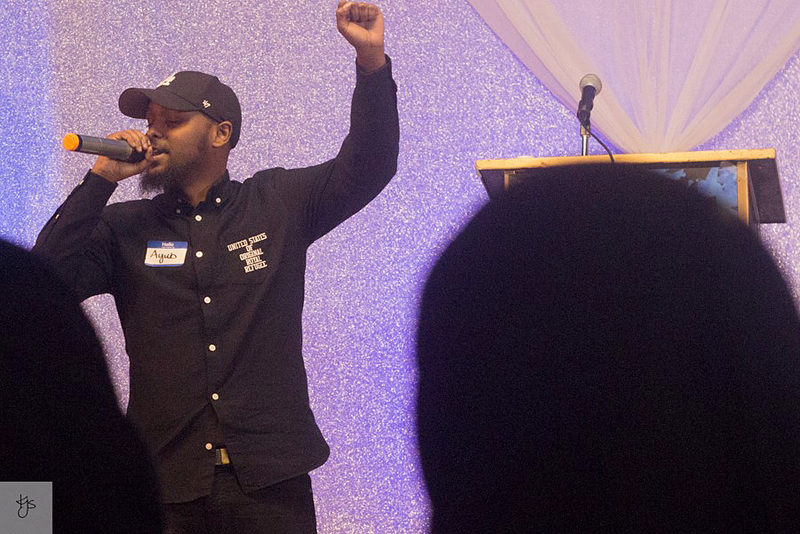 Poets read poems written from the perspective of a young person living in the Somali diaspora. An upcoming rapper performed at the event. T-shirts and red headbands, similar to those worn by angry protesters in Somalia, were available for sale and showed solidarity with the victims of the attack. The different initiatives raised nearly $9,500 all together. This money went to Aamin Ambulance, which provides free medical assistance for people in need in Somalia. Many of the surviving victims of the attack lack access to healthcare, Abdi said. Abdi also hopes to prepare the Minnesota community for whatever challenges lie ahead. She is working alongside the same group to develop a youth community center where young people can find a foundation for success.